It's no surprise that the retail industry is rapidly changing, always doing their best to re-shape and adapt to the latest trends and fads. But with online shopping being the easiest it has ever been with unparalleled convenience, retail stores are feeling the pressure to survive. The whole experience of shopping is changing and although right now it appears that online retail is the future, I wouldn't count traditional brick and mortar stores out just yet. According to a Harris poll, 69% of people are 'webrooming,' which is the act of researching products online before heading offline to the actual store to complete the purchase. 'Webrooming' is shifting the opportunity back to the brick and mortar stores. This means that people are still placing the convenience of online shopping aside and taking the time to make a trip to the physical store. Consumers value not only the purchase but also the experience that goes along with it. Hence, retailers need to maximize the consumer experience and provide an incentive to keep the consumers coming back and completing the in-store sale. It's time for brick and mortar retailers to capitalize on this growing trend by shifting and focusing on what truly motivates the consumer from choosing to complete the purchase in-store, rather than the convenience at their own home. 1. Consumers enjoy the hands-on and stress-free shopping experience with immediate help, if needed. 2. Consumers crave new, unique and personalized in-store experiences. 73% of consumers prefer to do business with brands that personalize shopping experiences. 3. How does the content on your screens look? Content may be king but don't forget about the formatting and aesthetics of the content on your digital signage. When done right, visuals grab your viewers' attention and convey information in an easy-to-digest manner which tends to have a lasting impression designed to impact and engage your audiences. If the content and design is repetitive, your employees, customers, or potential clients will tune it out. So be sure to make it lively. Also remember that location does matter! So be sure to conduct an audit for the digital screens too. This includes screen placements, screen size, line of sight, distance and traffic to enhance the consumer or employee experience and maximize results. 4. Shoppers increasingly want a 'seamless omnichannel experience.' Giving each store a technology revamp to adapt is advised and increases consumer interest. 5. Effectively using technology to include the retailer's online platform in the in-store experience increases engagement. According to Retail Touchpoint's global survey of customers, 56% of their respondents said they would spend more money at the actual retail store, if the location provided the opportunity for the consumer to browse their selection online first. This provides the convenience of online shopping and customizing with the in-store purchase and experience. 6. Consumers are attracted to the stores that add new initiatives for the connected in-store experience: tablets and mobile phones, smart dressing rooms with 'magic mirrors' and beacon hardware, which powers in-store maps and automatic hands-free payments. 7. Stores that contain a combination of online convenience with self-service functionalities and the power of choice. 8. Experiential retail experiences contribute to consumers getting to know the brand, which results in an increase in brand loyalty. 9. Modern retail experiences are unique and engaging for the consumer. There are many concepts retailers can utilize to keep consumers coming back like using interactive screens, gamification and social engaging. 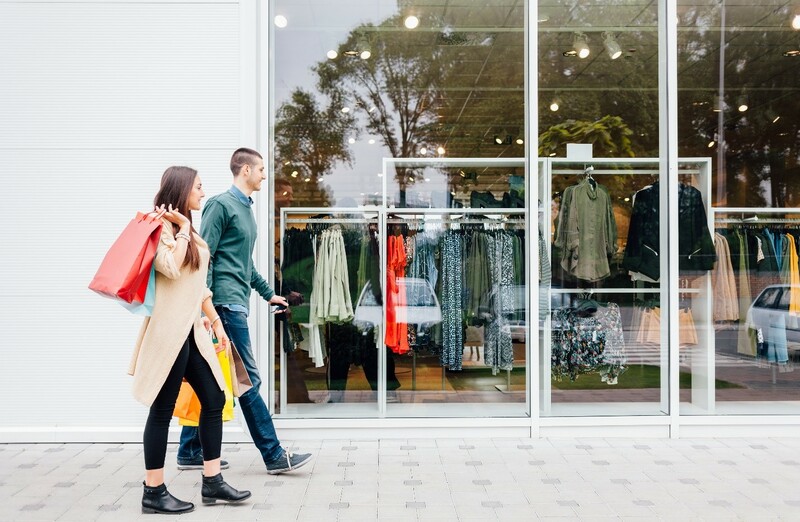 As brick & mortar retailers begin to acknowledge and embrace a more experiential and interactive customer journey, customers will not only become more loyal to the brand, but they will also experience a connection with the brand. That's because with a truly experiential retail strategy, all five of the customers' senses are connected with and they can immerse themselves with the brand story. Incorporating the human aspect of the consumer base and creating connections through interactive tactics like interactive screens, social engaging and gamification will definitely contribute to the success for a brick & mortar retailer. Retailers are now identifying and capitalizing on the initial qualities that are attracting the consumers to the physical stores in the first place and capturing the in-store sales. The brick and mortar stores that can effectively marry eCommerce platforms with their retail stores and provide the unique and personalize experience that the consumer is craving, will continue to exist within a future of online retail.